As they say, an ounce of prevention…you know the rest. But, it is true! In gardens, there are certain problems that are beyond our control when it comes to plant diseases. However, there are more ways than you may realize to prevent or at least reduce the chance of diseases affecting your plants. Plant diseases can be bacterial, fungal or viral. All can enter your garden through a number of different ways. And many times, it can be difficult to diagnose what the disease might be, if it even is a disease. Many symptoms appear similar from viral to bacterial, to fungal. Even insect damage and cultural practices can show similar signs. First, create the best growing environment you can for your plants. This includes putting the right plants in the right place. The soil should be loamy and well amended with plenty of organic matter, namely compost. A healthy, vigorous plant is better able to resist infection. If location, location, location is the key to the best real estate, than sanitation, sanitation, sanitation is the key to a healthy garden. Start with keeping any new diseased plants out of your garden. You do this buy inspecting all plants you are considering for purchase, to be sure you don’t see any obvious signs or problems, or buy “certified disease-free” plants whenever possible. Next, buy plants that are resistant to various diseases. This is common with hybrid vegetable plants for example, so if you like the choices, this is a good option. Always keep your garden free of weeds. Besides the obvious fact of being unsightly, weeds provide haven for certain pests, which are disease carriers. 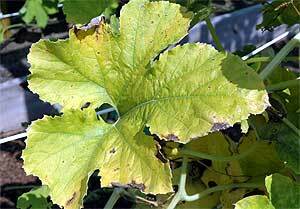 Once they begin feeding on other plants in your garden, they can spread disease to them as well. This goes for general plant debris as well. This should be removed as soon as possible, so as not to provide habitats for pests, or other plant diseases that finds rotting debris to be a hospitable host. If you suspect this debris to already be diseased, you should not add this to the compost pile. Rather, this should be removed from the garden and disposed of elsewhere. Adding diseased plant material to your compost pile can potentially survive the composting process, only to emerge again within finished compost. People and tools commonly spread disease from plant to plant. Keep tools like pruners disinfected. A simple solution of 10% bleach with 90% water is an effective remedy. Spray your tools often, especially pruners, and always after making a cut to a diseased plant. Avoid working around plants when the foliage is wet. Many plant diseases are spread through water. And for this reason, mulch your plants whenever possible. Mulch provides several benefits. One is to provide a protective barrier between the soil and foliage. Many plants fall victim to soil born diseases, caused when water splashes up from the soil, onto the foliage. Mulch is an effective tool in reducing soil related diseases. When it comes to watering there are a few important rules to remember. Avoid wetting the foliage and water early in the morning if possible. Watering early in the day gives the foliage a chance to dry out by midday. The longer foliage stays wet, the greater the chances of disease taking hold. Better yet, use drip irrigation as a way to minimize the risk of water transferring disease onto your plants from the soil. Finally, provide good air circulation between plants. Air movement keeps some diseases from sticking around long enough to take hold, and allows plants to dry out more quickly. In spite of our best efforts, gardens will still get diseases. There is no way to prevent them all. However, if you’ll apply the above practices, you will greatly reduce the amount of problems you’ll encounter.